Just last year for Eva’s 6th birthday we headed out on a really foggy day with a huge 6 balloon in hand to do a little photoshoot in the park. A mere 5 weeks later and there we were once again with Roma’s 2 balloon and just like that, I had started a new tradition. 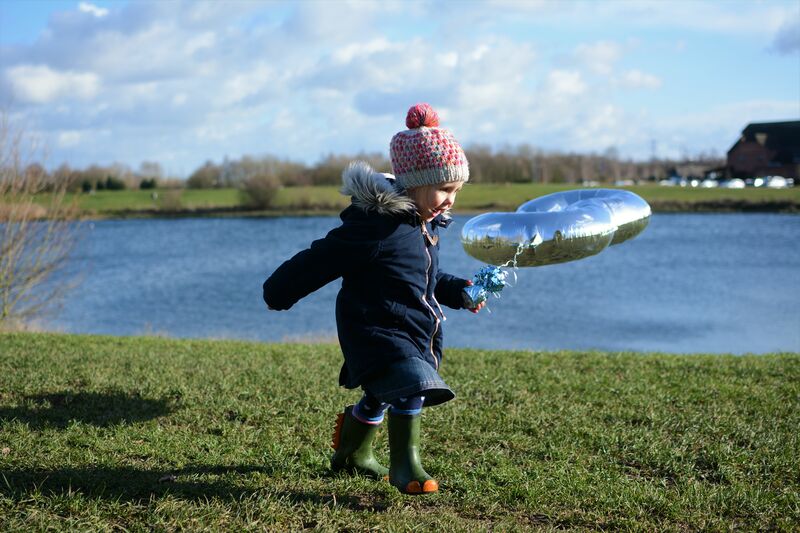 One little girl, one huge balloon and one Mum with a camera, what could possibly go wrong? I managed three without incident. Yay me. So this one, last week, marked the fourth and even though it is always a bit of a mission thanks to winter birthdays and the wind (I am looking forward to Eva being 8 where I don’t have to worry about it blowing the right way round!) I absolutely love it, I love looking back on the photos with their birthday letters. Also, and thankfully, the children love the chance to show off their birthday in the park and run around dragging it behind them and I know I will continue the tradition for as long as they will let me, 18? 21? Or possibly won’t get past the age of 10 before they refuse completely! Can you imagine if they do though, I will think that I have won the parent photographer jackpot right there. 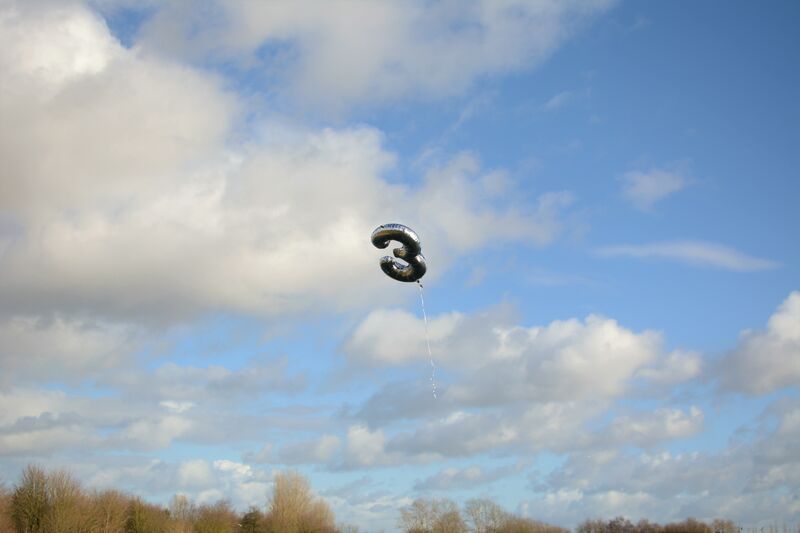 For some reason this year as we approached a local marina the day before her birthday Roma became obsessed with the balloon blowing away. This huge 3 had suddenly become her pride and joy, her best friend and under no circumstances did she want it to be left alone to its own devices despite the fact it was attached to a weight and I told her in no uncertain terms over and over again not to worry because it wasn’t going anywhere. Oh how ironic! I will admit that it was slightly windy and a little cold (read; really really windy and blummin freezing) but thankfully she was in good spirits and I took a few photos whilst she skimmed (threw) stones into the water and confused the ducks that it was in fact not bread, and I even managed to have some together too which is something I have never done before. We walked along the waters edge to take some more on a bridge and look into the stream below, when it happened. The thing she was afraid would happen and the thing I had assured her would not. For some unknown reason the balloon string unwound itself from the weight and with a sharp intake of breathe and a longing look into the bright blue sky and we watched it fly higher and higher, in total silence. Until that silence that seemed to last so very long and where time stood still was broken with a scream. A wail. Such a deep seated and almost instinctive cry that I have never seen before. She was absolutely devastated like her whole world had crumbled, which I guess it kind of is when you are 1 day off being 3 years old. 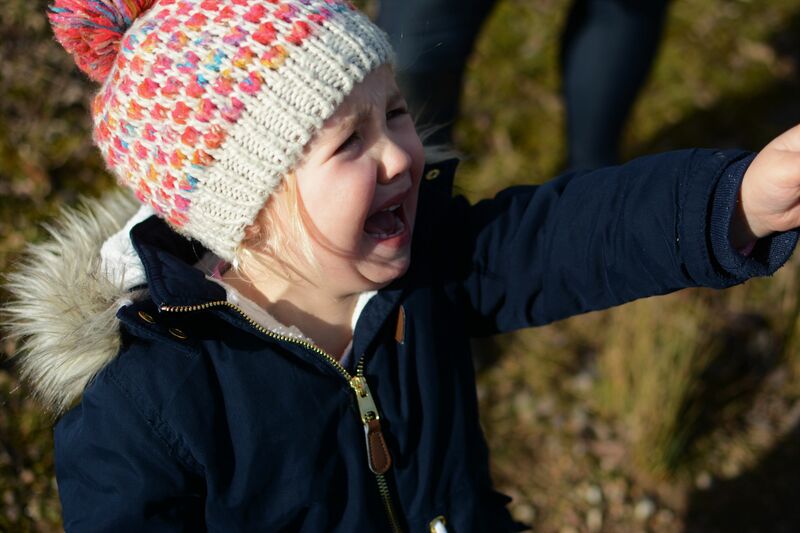 She sobbed and sobbed so hard and even a promise of a new balloon couldn’t stop the tears from rolling down her face as this instinctive wail escaped from her mouth. The poor little thing all I could say way sorry, I knelt down to hug her tight, I was so so sorry (and fearful that she would basically never trust me again!!!) Yet I couldn’t help but stare and her and smile a little inside, her innocence in that moment was just amazing and it really is the small things that matter. And the fact that I felt like I had just witnessed a ‘you’ve been framed’ moment, oh how I wish I had recorded it! 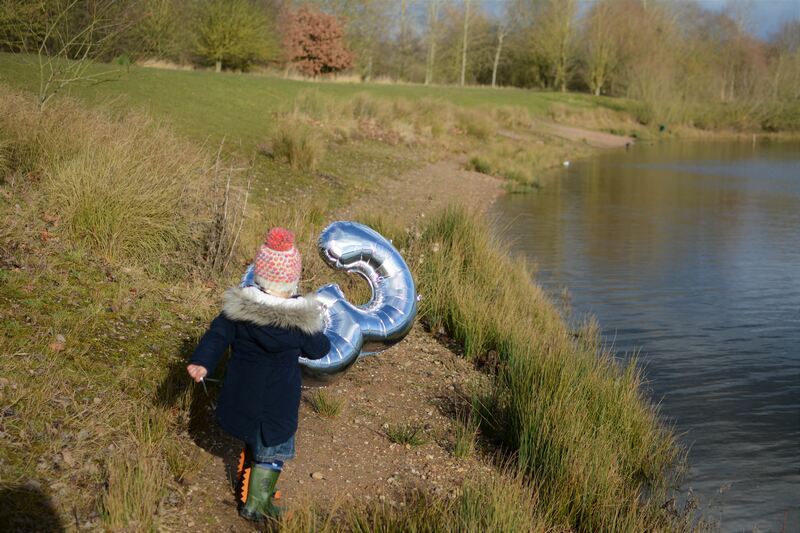 This balloon was like her treasure and as she stood there her little fingers wrapped tightly around the weight she had meticulously chosen and changed her mind and chosen again the grip would not loosen. Held there as a cruel symbol of what had been lost and that she was in fact not about to give that up for anything. We walked back to the car with tear stained eyes and people looking on. We of course immediately returned to buy a new balloon, one that she was now determined would not be going anywhere and refused to take out of the house. Thankfully I had already snapped a few photos and whilst I had more ideas in mind and had the same balloon stayed they might have looked a little different but with children, in life, sometimes you just have to go with the flow and be thankful for what you have got…..and not to scupper the chances of a balloon photoshoot again next year. I fear that I might well have ruined that and next year I will be battling her to take it out, perhaps tying it to a tree to keep it safe before giving in and having an indoor shoot. Wish me luck there! 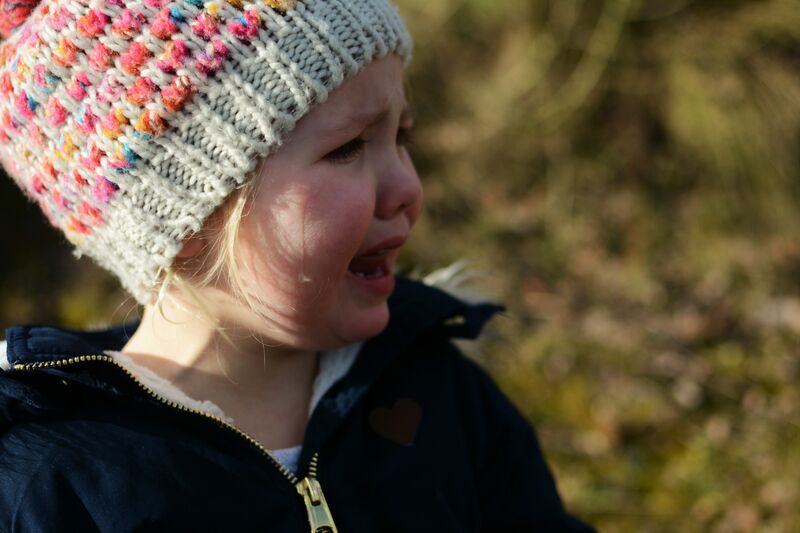 Ever since that day she has told everyone about it, it is etched in her little, now 3 year old, memory and I feel like it so perfectly sums up her character and her age. Everything is felt with 100% emotion, the elation, the fear, the sadness, she is not afraid to feel it, to show it and to be exposed to the world in the open and not care who is around. I love that about toddlers, about Roma and whilst I know that age, time and society will change that, I am going to continue to learn from her and to appreciate it whilst it is ordinary and laugh about it in years to come. 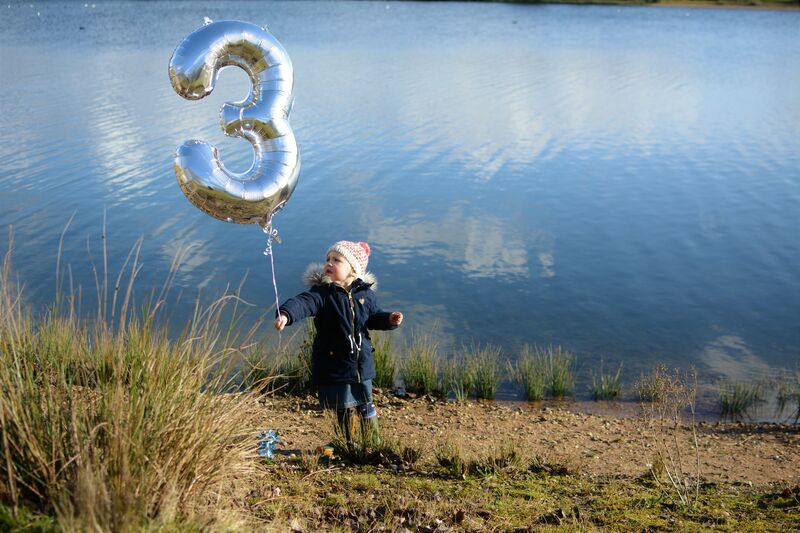 About her 3rd birthday and the story of the lost balloon. This memory will no doubt be the one that she never forgets! I of course shared the photos in her birthday letter but I thought I would share here the ones that didn’t make it in, but the ones that make me laugh now at the irony of the situation and the fact that I am just really glad we always do it the day before her birthday and it didn’t ruin her special day!! The 3 balloon is safe in the lounge where it will stay. Have you ever seen a more devastated face!? Bless her, this is raw childhood ordinary moments at their best, there are mostly smiles and lovely memories but sometimes they are sad and you know what? I want to capture some of these just as much as I think they will make us smile much more than we think in years to come and maybe just maybe when the children have children of their own, who do the same thing, they will feel like it is all part of ordinary motherhood too. Oh her little face. You just want to squeeze her. You did get some lovely pictures up till that point though, and I love the idea of the balloon photos, a great little thing to stretch out those birthday celebrations. 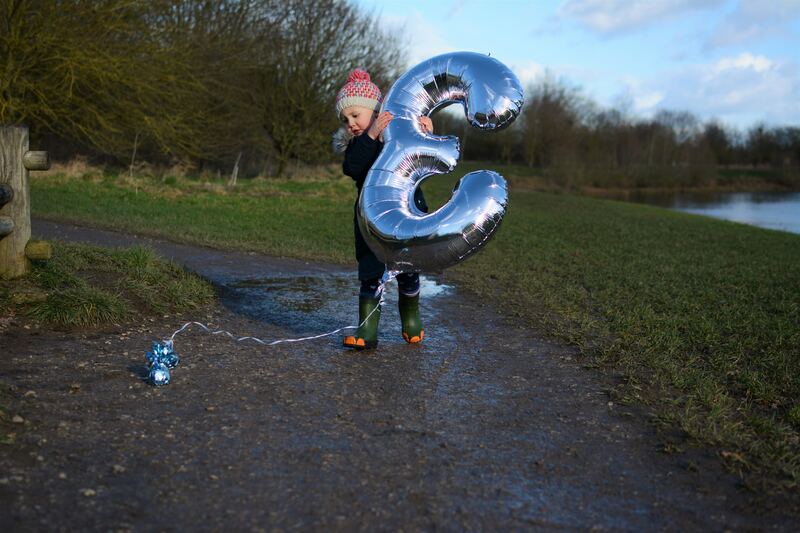 This just sums up 3 so perfectly – it’s an age where the little things like balloons mean so much to them! I remember Max got one from a restaurant recently, and his little face as he dragged it into our room the next morning, saying forlornly, “my b’loon blow down….” just breaks my heart! He’s just seen your pictures though as I was reading this and has asked for a balloon for his birthday – he doesn’t have the best track record in keeping hold of them either! Oh poor little thing! Lovely photos and lovely memories captured!